Join the Claremont Chamber on Tuesday, February 5th from 12:00 pm - 1:30 pm for our Lunch Mob!! Enjoy a great lunch while supporting Euro Cafe. Members supporting members is what the Chamber is all about!! Bring your friends, co-workers, and family. Join us between 12:00 pm and 1:30 pm, order from the menu, and pay for your own lunch. All we ask is that you RSVP so we can provide the restaurant an idea of how many members will be mobbing them!!! 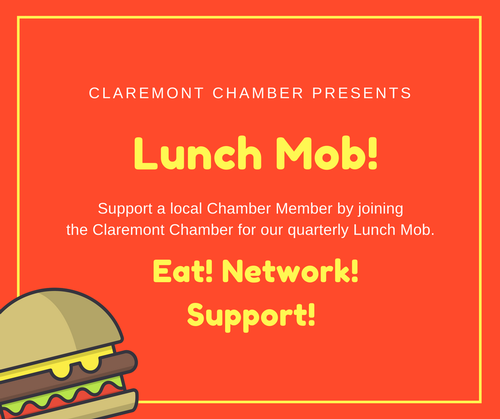 Support a local Chamber Member by joining the Claremont Chamber for Lunch Mob.